Adds all posts in this category to the Home page. 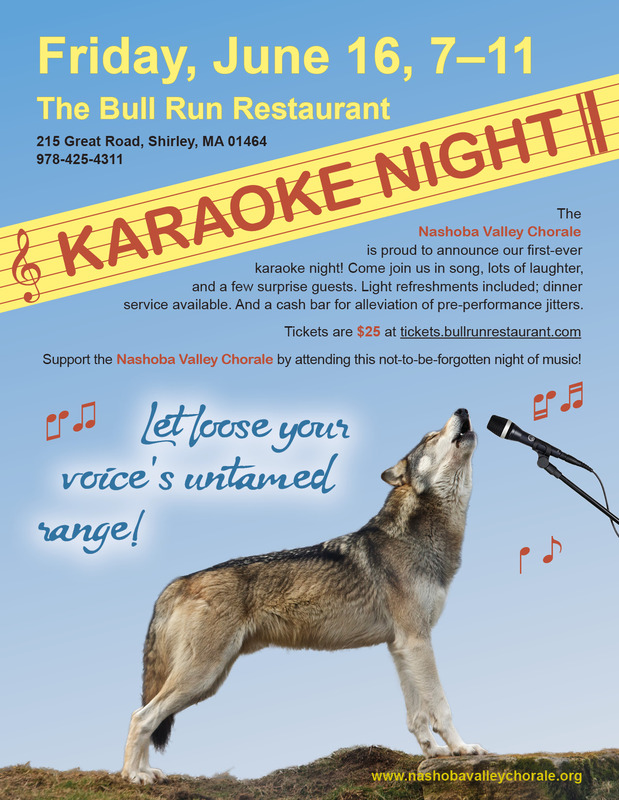 The NVC will be hosting its first annual Karaoke Night at the Bull Run Restaurant in Shirly, MA, on Friday, June 16th, from 7:00 – 11:00pm. Doors open at 6:00pm. Come join us for a fun evening singing your favorite songs and showing off your musical talents, or just come to see your friends show off theirs. Music of all genres will be provided by the dynamic DJ Andrew Greene. Light appetizers are included, along with a cash bar. Dinner from the Bull Run menu will also be available. Tickets are $25, available at the door, or online at https://tickets.bullrunrestaurant.com/orderticketsarea.asp?p=1296&a=41&src=default. Hope to see you there for some song, fun and laughter! Join us as we start our rehearsals for Rossini’s Petite Messe Solennelle. Our first 3 rehearsals are open. This allows you to try us out before actually joining. We do request that those who decide to join pay dues by the 4th rehearsal. Dues are $60.00 for this session. Music will cost $20.00 you may borrow the music for the first 3 rehearsals. Please come early to sign in and get music and handouts. We typically start Rehearsals at 7:30 pm. The first 3 rehearsals start at 7:00 pm allowing us time to meet one another and get ready to sing. We had a blast rehearsing for the Bach Mass in B Minor and expect to have an enjoyable time over the next few months. We will be singing the Rossini on May 31st. What a moving concert we sang yesterday. Everyone involved deserves an extra standing ovation. Many people commented about how moved they were by the performance. Please add any additional comments to this post. We want to hear your views and opinions about the concert. Thank you to everyone involved and to all those who came and supported us in this endeavor. For those whose lives are enriched by beautiful music The NASHOBA VALLEY CHORALE is a hidden treasure. I was blown away by their performance of ELIJAH. You have to experience the marvelous artistry and hear the acoustics at St.Ann’s Church in Littleton to understand. Give yourself a gift and go to their next performance.